On December 1st, 1987 policeman Phillip Spencer spotted a strange creature on Illkley Moor in Yorkshire, England. The creature seemed to be making gestures indicating "stay away." 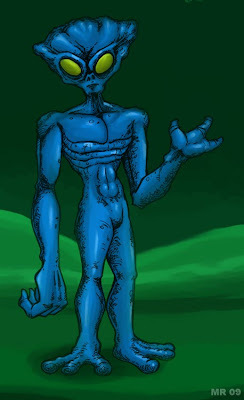 Spencer managed to get a blurry photograph, which shows a humanoid creature about 4 feet tall, with long arms and a blueish tint to it's skin. After noticing an instance of "Lost time" around the episode, Spencer decided to undergo regressive hypnosis and regained more memories, most of them typical of abduction experiences - artificial levitation, medical examinations, a strong environmental message. Along with this came further descriptions of the creature, such as their "funny feet" and three fingered hands, with fat fingers "like sausages." Was the Illkley Moor alien real? Unfortunately the photograph is too gainy to be conclusive. However due to the integrity of the witness this case remains one of the more credible.